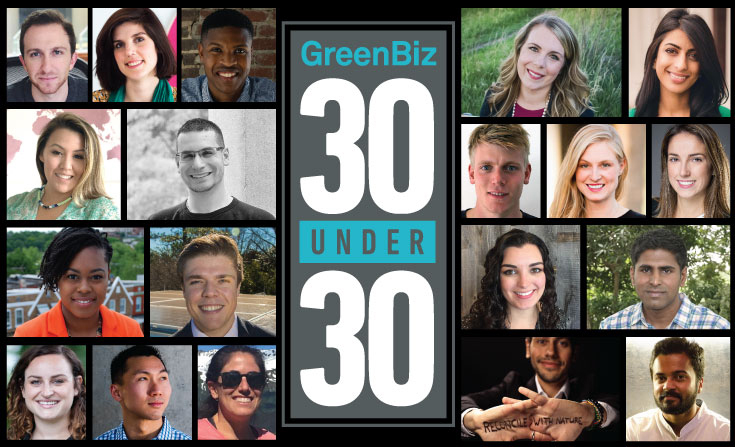 OAKLAND, Calif. and GENEVA, Switzerland, June 5, 2017 /3BL Media/ — GreenBiz Group and the World Business Council for Sustainable Development today named the 2017 “30 Under 30,” based on a global search for emerging leaders across sectors who are shaping the next generation of sustainable business. The 30 individuals being honored come from nine countries on five continents. They work for multinational corporations, innovative startups, social enterprises, nonprofit organizations, government agencies and academe. A dozen of this year’s roster work for some of the world’s largest companies, including Asia Pulp & Paper, C&A, Cummins, DanoneWave, Dow Chemical, EY, IKEA, Interface, Lexmark International, Morgan Stanley, Saint Gobain, Salesforce and Unilever. Other honorees include the head of sustainability for Atlanta, Georgia; the environmental director of the world's largest owner of sports teams and sports events; and one of the leading lights in cleantech journalism. “These emerging sustainability leaders bring passion and talent to the world's pressing social and environmental challenges,” said Peter Bakker, President of the World Business Council for Sustainable Development. “It is critical that we identify talent and future leaders early as they are key for successful businesses. These young professionals will play a crucial role in defining their company’s sustainable future. We're excited to recognize their great work and leadership and we also look forward to watching how they transform the sustainability landscape throughout their careers. WBCSD warmly congratulates all of the nominees — well done and keep it up!" The complete list of 2017 “30 Under 30” honorees is below.